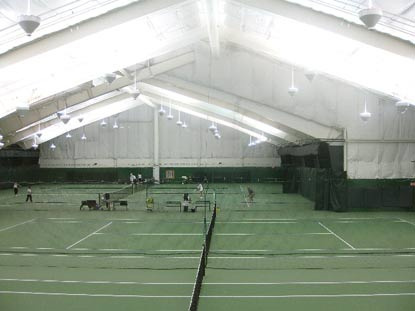 Wightman Tennis Center's four indoor tennis courts are made of high-performance Rebound Ace material, which provides extra cushioning and reduces stress on the knees without jeopardizing ball speed. The indoor court lightning has been recently updated to provide bright, even lighting across all areas of the court. Courts three and four are also equipped with Playmate ball machines for your convenience. Outside, our twelve Har-Tru clay courts are always well-groomed and ready for play, weather permitting. At night, you may choose to play on one of four outdoor lighted courts. Typically, our outdoor courts are open from May through October.